Arrows and spear tips discoveries in the vicinity of Malga Pioda confirmed the presence of man on the territory starting from the Mesolitic Period (6.000-4.500 B.C.). In 1985, in the municipality of Selva di Cadore, a Mesolitic tomb was found by Vittorino Cazzetta under a huge stone. Regarding the Roman time, we don’t have information about sedentary settlements in the Alleghe territory. 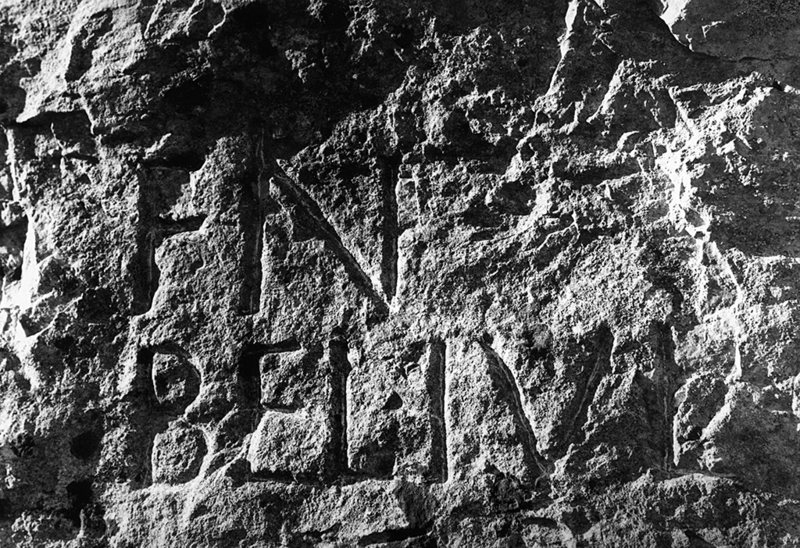 Although, in the 1930’, three roman borderstones were discovered by the alpinist Domenico Rudatis (dating 54 A.D.). We have little information about the period of the Barbary. Concerning the Medieval period, the first document mentioning the village of Alleghe, was a papal Bull written by the Pope Lucio III in the 1185. At the beginning of 1300, the dominant Sommariva family was the proper of a palace and an ancient castle of fortified tower (nowadays, the buildings are submerged in the bottom of the lake). From 1321 to 1350, the power was in the hands of the Avoscano family and the richness of the territory was due to the presence of iron and led (from local and the nearby Fursil mines). Thanks to the mines, Alleghe became famous in the forging of sword blades, appreciated due to their high quality. The dominion of the territory passed through Carl IV , Ludovico of Hungary (in 1360), Francesco da Carrara and, ending with Galeazzo Visconti in 1388. From 1414 to 1420 the territory was conquered by the Bohemian-Hungarian king Sigismondo and between 1510 and 1797 the land of Alleghe passed under the control of the Republic of Venice (Serenissima Repubblica di Venezia). Reports of the time informed us how the landslide falling blocked the stream leading to the formation of the present Lake of Alleghe. Ne qui si pone fine a ciò, che di particolare si può accennare di lugubre. Rinchiuso il corso del fiume Cordevole, viene per conseguenza a formarsi un lago, che di giorno in giorno si va alzando[…]”. Soon after the landslide of the 11th of January had settled, the inhabitants planned to make an opening in the natural dam caused by the fallen rocks , in order to recover the flooded crops. 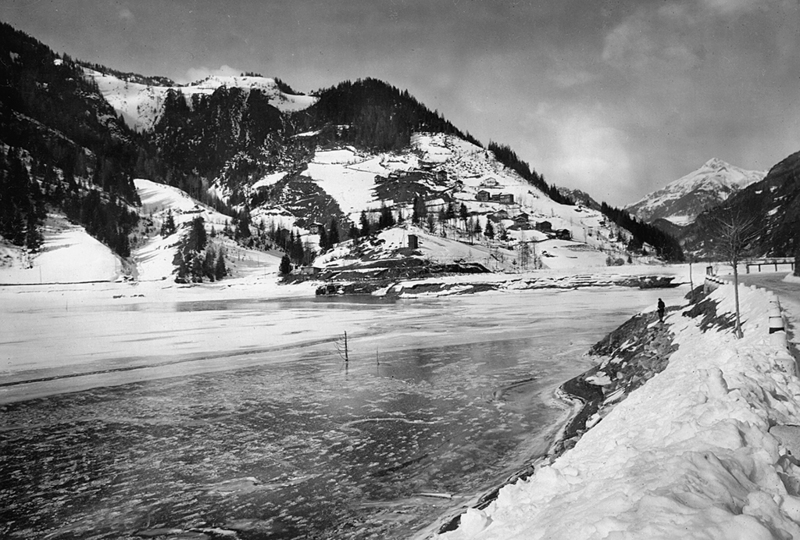 It is known, that at the end of January the lake was 30 meters deep and it was therefore common concern that with the next thaw , the river Cordevole would have carried too much water and hence, caused major floods to the valleys downstream. The lord provost of Belluno stated :” It is our belief that , once the snow and the ice have fully melted , the water would infiltrate through the rocks causing a powerful irruption. The force of the water would isolate the well populated villa of Cencenighe, the countryside of St Cipriano , Agordo along with other villages downstream of the Cordevole”. The lord provost supported the idea of creating a side canal to prevent Costa , Soracordevole , Sommariva and Torre from flooding. The total cost estimated for the project was of 5000 Ducati and 854kg of soil. 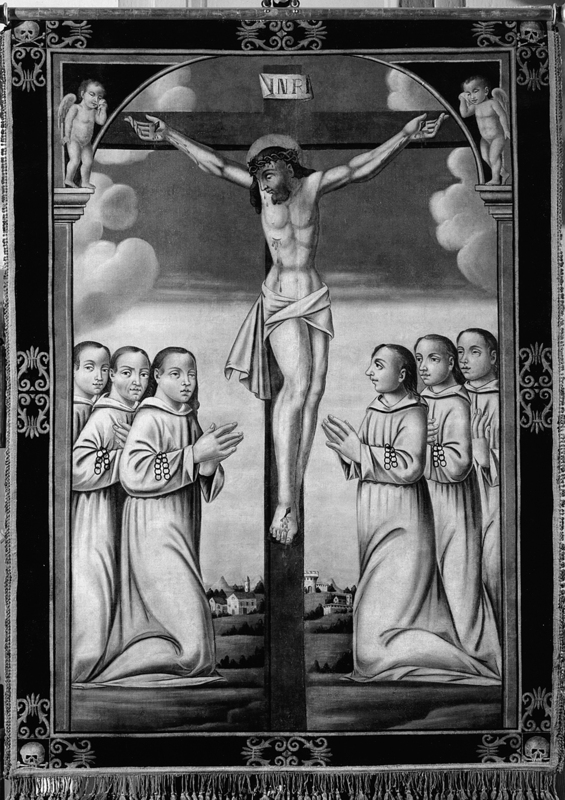 According to the lord, the son of the stewart of the mines of Val Imperina and his personnel , were the best choice for this kind of work. On his report to the Venetian Senate Balbi attached the technical analysis of the engineer Doglioni , who inspected the site on the 21th of January. In his technical analysis, Doglioni described and measured the size of the area covered by the fallen rocks. It was 1200 steps long and 70 steps high. Additionally ,he noted that the flooding of villa di Sommariva and Costa was imminent , as he calculated the speed of the rising water compared to the already high level of the lake. He stated:” It would be too difficult and too expensive to attempt to fully fix the mess, however it would be most convenient and even quite easy task, to protect the lands who are exposed to the flooding. A 300 steps long and 5 steps high opening in the rocks , would save villa dAlleghe and decrease the level of the lake. Therefore we can confidently say that the countryside of Alleghe , villa di Sommariva di Sopracordevole, Costa and of other small villages would be fully recovered”. This was the thought of Doglioni : a sensible analysis and a sincere hope to save part of the lands. However, in order to work, the intervention had to be fast. As a matter of fact , it had to be done before the (already full) river found its way through the landslide, as once that happened it would have been impossible to do any kind of work. At this point even the local priest promptly wrote to the lord provost of Belluno . He stated:” …Since the lake keeps rising more and more everyday and it has already flooded the first house and some of the land near villa di Sommariva , we expect that the main flood will soon cover all the surrounding area including ville of Sopracordevole and Costa…”. Despite the pressure , the Serenissima did not find the technical analysis of Doglioni convincing enough. As a result, the offices sent the engineer Commander Colonel Dixon , who, once he arrived on site for the inspection , realised that the situation had changed for the worst. The water was about to overflow and he was forced to admit that the only solution was to suspend the work and wait for the nature to take its course. What brought the Commander to his final decision , on top of the already imminent flooding , was the difficulty to gather the right personnel , the extremely harsh weather conditions and of course the very high costs.This is why , Dixon wrote to the Venetian Senate asking the authorisation to build four extra boats and one extra raft to finalise the evacuation. 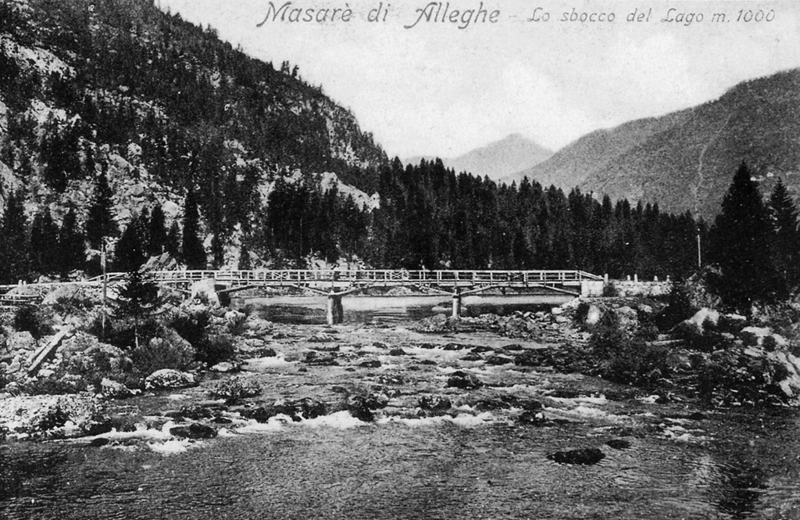 The bridge of Masare in the early 1900s. In order to reopen the trade route with Europe ,it was essential to build a new road that from Caprile reached the near Austrian border. Furthermore ,villa d’Alleghe needed a new road that would create a link with the left bank of the river Cordevole. 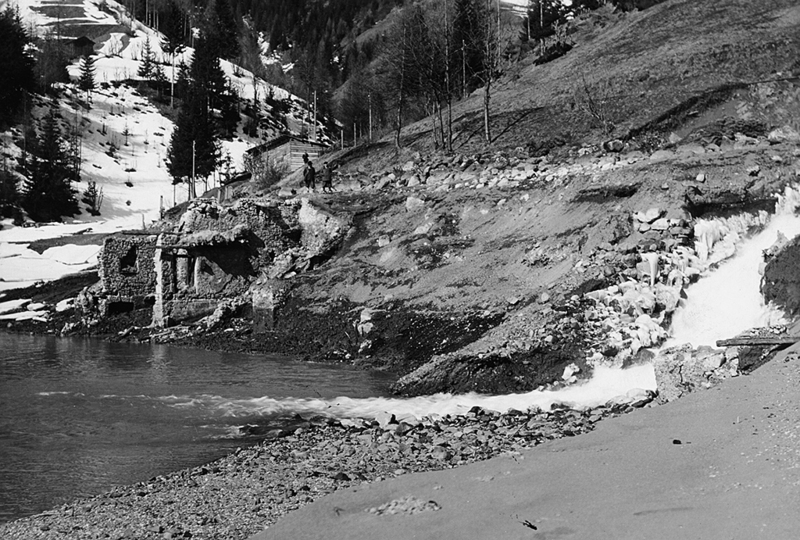 Not last , the water path used to transport wood from Calloneghe and Alleghe to the valleys needed to be reopened , as it had been covered and blocked by the landslide. The building of a canal was therefore essential for both the recovery of the crops and for the reopening of the wood trade. Eventually ,on the 16th of May 1771 the Senate released the order and Captain Moser, second in command of Commander Colonel Dixon, arrived in Alleghe on the 10th of June. The reverend Antonio Nicolai , who clearly disliked Captain Moser, wrote a letter to the lord provost of Belluno declaring that:” The work realised by the Captain is nothing special , anyone with a little knowledge of mathematics could do better”. The nature of the complaint made by the reverend referred to the one sided view of the project of the Captain , whose only aim was to reopen the wood trade route, ignoring to consider the possible recovery of some of the flooded land. The complaint had its strong points, especially after the canal for the flotation of wood was completed. It only lowered the water level of the lake of 70cm . In addition, with the completion of the bridge that crossed the river Cordevole in Masare’ , all hope of recovering the submerged lands by digging a deeper canal was gone. Little has changed from those times. The landscape experienced minor changes due to the erosion of the Cordevole and due to some maintenance of the banks.However , the natural dam formed with the landslide has enclosed those clear water forever since. 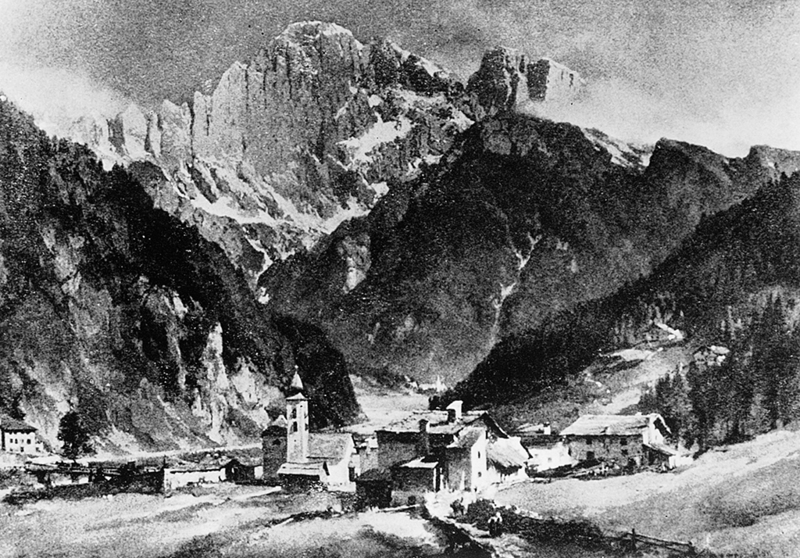 The landslide of mount Piz has been a shock for the everyday life in Alleghe and Calloneghe ,as it completely destroyed Riete , Fusine and Marin, and caused the flooding of other five villages : Peron, Soracordevole, Costa , Sommariva and Torre. The valley flourished during the apogee of the Republic of Venice, however after the second half of the XVIII it started to slowly decline, especially in the aftermath of the landslide. The local economy was based on metallurgy and it developed all along the river Cordevole. It started from the mines of Fusil near Colle Santa Lucia, where the iron was extracted, then it was transferred to the foundries of Caprile, which shaped it in rough bars and finally it was brought to the masters smithies in Alleghe. Although the skilled blacksmiths of Alleghe shaped the iron bars mainly into weapons, such as swords, spears, halberds and daggers, they also produced other everyday tools, like scissors ,razors and cutlery. The local weapons must have been the best in the European market. First of all, the iron extracted from the mines of Fursil was of the best quality, secondly the tempering method of the blacksmiths was so fine , that it contributed to the victory of the battle of Lepanto in 1571 . The villages of Fusine and Marin were the most productive, thanks to their strategic position right on the river Zunaia . The waters, with its constant stream powered the water-mills and therefore kept the forges always working. In 1748, the river Cordevole flooded and destroyed most of the forges in Caprile , but the fatal blow for the local economy was definitely the landslide of mount Piz, in 1771. The valley of mount Civetta was very different from how we see it today. 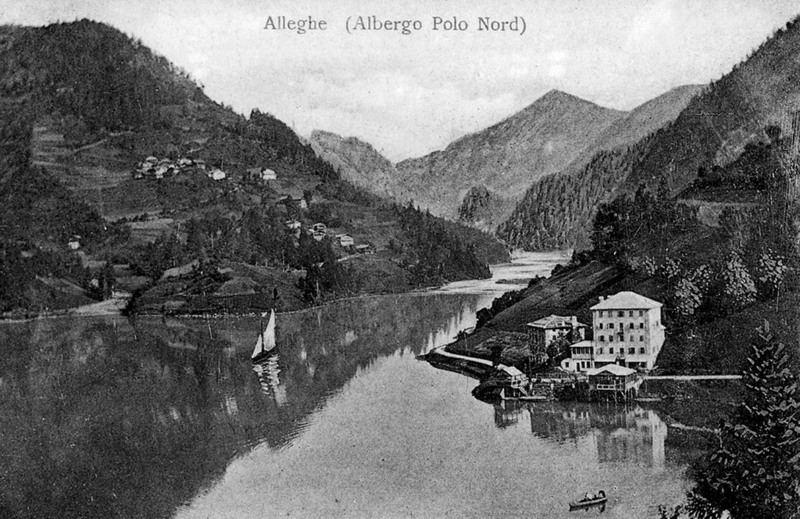 There were fewer woods, as most of the territory was used for crops and pastures , and the shape of the river Cordevole flowed through Avoscan and Caprile ; on the slopes of the hill of Alleghe , where the old church is located , we would have seen crops of wheat and potatoes, extending to the banks of the river. This sight facing south was certainly very attractive , also thanks to the defensive tower surrounded by the village. A little further downstream, we would have found the palace of Sommariva, along with a few houses and barns, one mill and one forge . 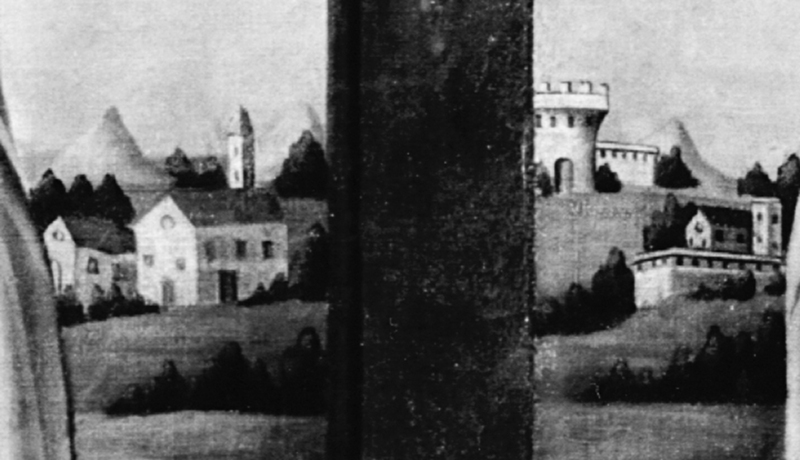 Today, the only image of this place can be found at the feet of the Battuti coat of arms, preserved in the church of Alleghe. Even further south we would have found Marin and Fusina, characterised by the wooden water mills of the forges. 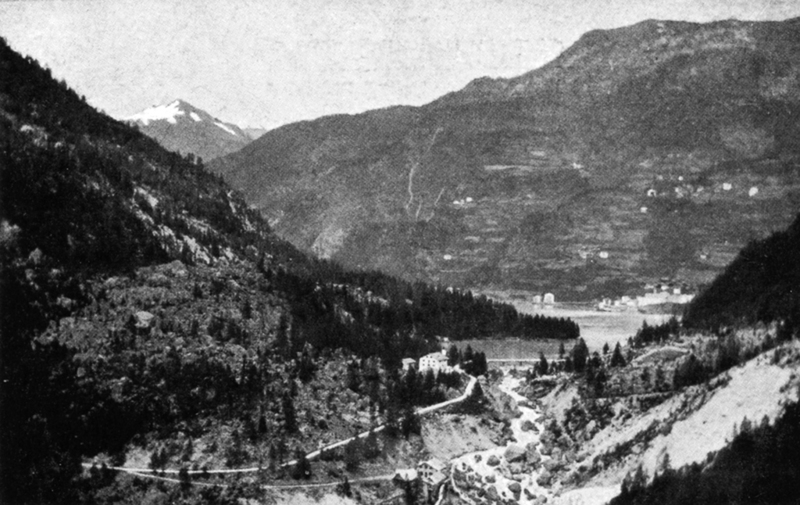 In the middle of the slopes of mount Piz , built on the remains of an old landslide there was the village of Riete, first to be destroyed by the rockslide. While, a little further north , below villa Savinier, there were the inhabitants of Peron, Costa and Sopracordevole , last to suffer the effects of the flood caused by the cataclysm. Not only the land, but also the architecture must have been very different, As opposed to the 1800s architecture present today, the old style would have included wooden houses with a block-bau structure, still present in some of the barns . More evidence was brought forward by the statements of the few survived evacuees, who described in detail the shape and location of their home. Sadly but inevitably , the process of rebuilding almost completely erased these ancient wooden houses, only seldom found today in some areas of the region. Another detail worth mentioning ,is the common area often found between the “mason” (stable/barn) and the living quarters. Clearly the structure and organisation was much less strict than the one we have today. The legal offices of Venice listed in the so called “Piani”, the names of the inhabitants who survived and suffered damage from the landslide. A total of two were written after the disaster. The first “piano” dates 18th of March 1771 and reports in two parts the lost goods of the families. The first part lists the goods belonging to the inhabitants of Riete , Marin and Fusina who luckily survived the the cataclysm as they were somewhere else when it happened ; the second part reports the belongins of those families of Peron, Costa and Soracordevole, who lost everything in the flood. The total amount of refugees caused by the landslide, was of 219 and the estimate value of the lost goods was of 85’500,10 Venetian Lire. The second “piano” describes the list of families who lived in the villages of Pian D’Alleghe , villa Savinier and Rudatos and lost their goods in the aftermath of the flood . After the Piani were examined and a precise estimate of the rebuilding-plan was made, on the 8th of April, Alleghe eventually received the sum ( two Ducati per head) needed to help the refugees. In order to house the evacuees , it was initially decided to place them in the monastery of Vedana and it was estimated a total of 4800 Ducati to complete the project of reconstruction. It costed 80 Ducati per building included labour and the cost of the materials was not included. Although it was a very expensive job , the administration decided to go forward with it , as the potential damage the refugees might have caused to the ancient and prestigious monastery would have been of a much higher toll. Thus , on the 8th of June , the supreme court of Venice ordered the start of the works ; the total credit line was of only 4000 Ducati , as the value of fifty buildings completely destroyed by the disaster, was seriously underestimated by the engineers. The financial aid and the tax exemption, gave these unfortunate people the opportunity to rise from their misery and to live a new life. In 1030 A.D. the order of the “Canonici di Belluno” received the vast unploughed lands located on the right banks of the creek Cordevole by the concession of bishop Ermanno. The land, today known as mount Bramezza, was originally called Premezze di St. Anselmo, in reference to the early fruits that the settlers had to harvest and provide to the Church. The ploughing was commissioned to a few families , who slowly settled and developed the first colonies ,giving birth to several villages. The Calloneghe was the name that identified a series of villages and communities under the administration of the Canonici di Belluno, they were : Riete, Peron, Costa,Savinier, Bramezza, Caracoi, Sdernade, Pezze’ and Soraru’. The powerful increase of the natality rate and social development during the XI and the XII century , were the key facts that triggered the urbanisation of several alpine valleys and lands through ploughing and deforestation of entire terriotories. Unlike the peasants often oppressed under the authority of a lord, the settlers of these lands were free men. However, they had to adhere to the “Rationae Tenementorum” , a rule which involved maintenance work of their own lands and paying a tax to the Canonici of Belluno. The tax varied depending on the size of the land and the contract of rental was, again, subjected to the authority of the Canonici di Belluno . Although these leasing contracts were originally stipulated only by verbal agreement, by the XIII century the papers started to be validated by notaries. The acts can still be read today and they reveal the the first forms of private properties in the area. This community differed from the nearby territorial and legal rules of Agordo so greatly that, as mentioned by the writer Piloni, they succeeded to refuse a call to arms imposed in 1320 A.D. by the Council of Belluno . The Council was recruiting men to fight for Vecellione count of Ceneda and Capitan of Feltre and Belluno, hovever the inhabitants of the Calloneghe were free of any constraints and therefore able to decline the call. Evidently , the refusal caused some major concern , but on the 6th of August of the same year the court spoke in favour of the inhabitants , making them winners of the dispute. A form of protection to the settlers must have been provided by the near Rocca Pietore. As we know , in 1392 they sent their herald to the bishop of Pavia to plead for the exemption of a toll to the Rocca , since it was destroyed the previous year. However these rights were transferred to Belluno thanks to the decision of the Capitan of the city who , offered his protection in exchange of sixteen blocks of cheese, sixteen chickens, sixteen sacks of wheat and seventeen sacks of rye. The protection of the Capitan was strong and powerful, as a matter of fact on the 9th of March of the year 1567, the inhabitants called for his help against the right of cancellation of lease that the Canonici were exerting. The decision to “evict” the inhabitants was made by the clergymen as a result of the relatively low revenues the lands were offering; as a consequence, the lands were then sold to the highest bidder in a public auction. The last attempt of the settlers to officially secede from the influence of the Canonici, was to be recognised as land owners of the city of Belluno , in name of the ancient tribute paid to the city. The dispute settled on February the 1st 1568 , when the two consuls elected by the council of Belluno to resolve the matter , decided to support the Canonici in their right to operate the conversion of the lands. The only way the settlers managed to regain possession of their territory was to buy the lands off the Canonici with the payment of a tribute , with the approval of the Regency of Belluno on behalf of the King. However , through this move, the Calloneghe lost their independence and were absorbed in the legal and territorial rules of the Captaincy of Agordo, Comun di Soprachiusa , under the regency of Belluno . Consequently , since 1604 the community files started to fill the registries and the archives of the Agordinian territory, being part of the region at all intents and purposes. 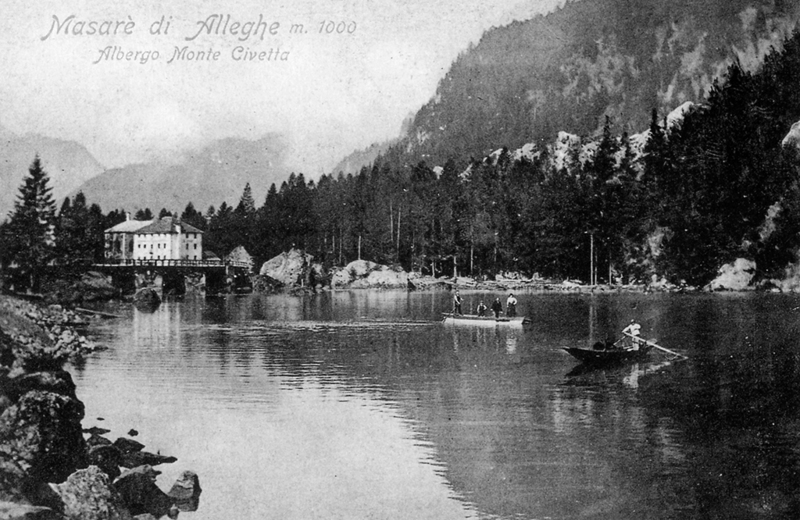 Late 1800s the lake reached beyond the Calloneghe. The church of st Biagio and Sdernade were separated by the old part of the lake ,and apparently the separation was not just just on the map. As a matter of fact the village of Sdernade took full advantage of the situation to officially separate from the influence of the church of st Biagio. The excuse used by the Calloneghe to secede from the parish of Alleghe and become independent referred to an occasion when the local priest Don Nicolai failed to assist and consecrate the passing of the elder man Giovanni di Lazaro de Biasio . On that day, the 20th of January 1771, the priest was hosting the visit of the regent of Belluno who came for an inspection of a tragic landslide recently occurred in the area. Only after a complicated and difficult legal battle, on the 15th of December 1774 the two parties came to an agreement in regards to a separation from the original parish and therefore giving birth to a new one.